"We have a great concept, location, staff, and we hold on to our key people." It's the basic key to the success of Harry's Restaurant, according to co-owner Linda Cohen. 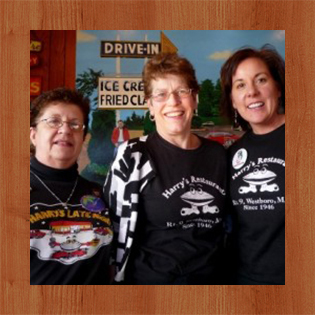 On April 9, Harry's Restaurant celebrates 70 years in business, under the ownership two generations of the Cohen family. The most surprising aspect of Harry's menu is the shear breadth. Harry's has it, whatever it is. The menu is an endless list of entirely homemade comfort foods: full breakfast, American diner standards, steaks, burgers, pasta, club and open-faced sandwiches, wraps and pockets, salads, soups, stir fry, platters, sundaes and frappes, a kids menu, and, of course, loads of seafood. The place really excels as a clam stand, but it also has the long hours and anytime breakfasts of a diner, as well as some serious Italian entrées and a variety of local and national snack foods. It looks like a diner inside, but has tables as well as booths, and a low " bar " with stools. It also has the handmade signs of a diner, but not so much stainless steel, and there seems to be a real kitchen out of sight in the back.